While searching Alaska for the Totem of Lights, an ancient Eskimo artifact rumored to connect heaven and earth, Samantha Swift uncovers an elaborate Atlantean medallion with strange symbols and magical powers. 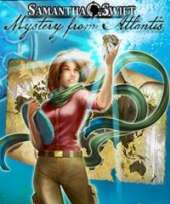 She must travel throughout the world the recover all the items carved on the object, to stop the evil plans of an aggressive group of tomb raiders that intend to use the device to obtain great power. This is the third entry on a series of hidden object titles with elements of the adventure genre. At the beginning, the player can choose between a timed mode, where each chapter has to be completed in forty minutes, and a relaxed mode without any pressure. Most of the time, the objective is to find and click on all the items listed at the bottom of the screen, on locations around the globe filled with scattered objects. Some of the list entries are written in blue to indicate the need of an action or the use of an inventory object to reveal them. Yellow entries are written as riddles instead of names, and are worth more points. The radar screen shows the silhouette of any selected item entry. Some of the items collected are stored in the inventory, shown as a rolled up backpack at the bottom of the screen. They have to be used later when solving puzzles, by dragging and dropping them on logical places of the scenery. There are a few mini-games, where the player has to find the differences between two similar images, complete a tile-matching game, and solve other puzzles by direct manipulation of a mechanism of some sort. The hint button shows the exact position of one of the required items. Extra hints can be collected as lightning bolts hidden on the scenes.